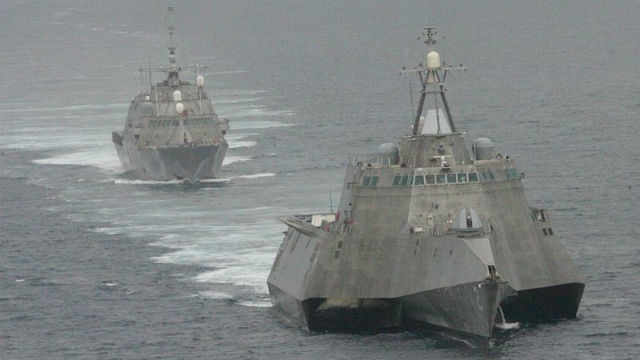 Navy Secretary Ray Mabus defended the troubled littoral combat ship program Wednesday, saying every new class of ships has early problems. “These ships are great ships. They fill a critical gap,” he told reporters after speaking to the San Diego Military Advisory Council in Pt. Loma. The ships are being produced in two versions, the single-hull Freedom variant and the trimaran Independence version. Both types have suffered breakdowns. All of the the ships built so far are based in San Diego, and a total of 52 are planned. Mabus said “dire warnings” are raised about every new class of ship as the Navy works through problems and makes improvements. Starting with the 18th built, the ships will be reclassified as frigates due to changes making them more lethal and more survivable.